Did you know? People consume up to 2,400 calories during the Super Bowl. That’s enough to completely undermine weeks of hard work at the gym. 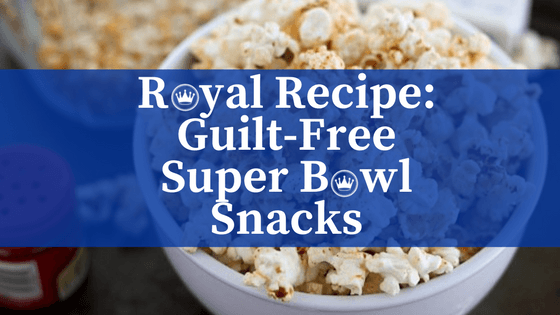 But since snacking during the Super Bowl is part of the fun, we’ve rounded up 5 guilt-free, yet still yummy, snacks to keep you happy all game long. If you try any of these recipes, let us know! 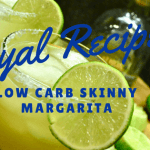 Take a picture and tag it #RoyalRecipes on Facebook or Instagram so we can see it! 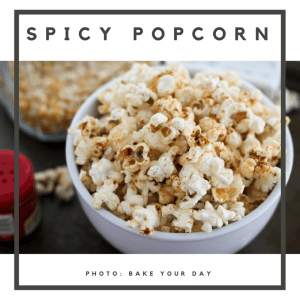 This popcorn recipe from Bake Your Day serves a hot and flavorful twist with its spicy cumin and cayenne pepper flavoring. Hint: Choose a low-fat, low sodium pre-packaged popcorn, or pop your own kernels in a small paper bag in the microwave. Heat one the chili oil and grapeseed oil in a medium heavy-bottomed pan over medium heat. Add a few popcorn kernels and let it heat up. When one kernel pops, add the popcorn kernels and cover the pan. Shake the pan a little to spread the kernels in an even layer. Let the kernels pop for several minutes until the pan is full and the popping slows down. While the kernals pop, melt the butter and then stir in the salt, garlic powder, paprika, cumin and cayenne pepper and mix well. Remove the popped popcorn from heat and transfer popcorn to a large bowl. Slowly drizzle the butter/spice mixture onto the popcorn, shaking to distribute. 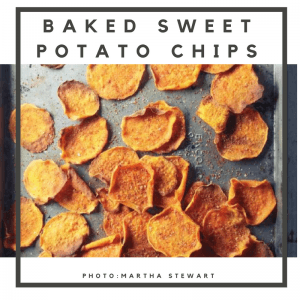 Of course Martha Stewart would come up with this delicious chip alternative. Baking sweet potatoes reduces both the fat and the grease content from regular chips, and you can *kinda* count them as one of your vegetable servings for the day. 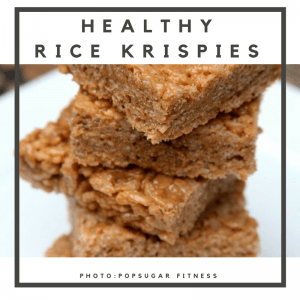 This Rice Krispy recipe from PopSugar Fitness includes protein powder so you satisfy your sweet cravings, while also getting and kick of energy (while satiating hunger!) from the protein. Take that Snap, Crackle, and Pop! Prep a 9-by-13-inch pan by lightly spraying with cooking spray. Heat the brown rice syrup and peanut butter in a large pan over medium heat until liquefied, about 5 minutes. Turn off heat and stir in the vanilla extract and protein powder. Quickly stir in the rice cereal until well coated. Pour the rice mixture into the prepared pan. Press firmly and evenly into the pan using the back of a spatula. Cool in the fridge for an hour, then cut into bars. Martha kills it again with these individual nachos. Your favorite brand of tortilla chip scoops. Preheat oven to 350 degrees. 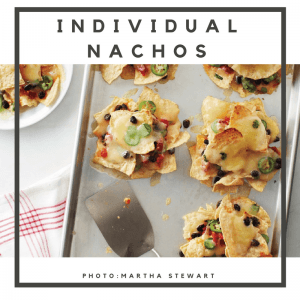 Build six stacks on a rimmed baking sheet by alternately layering tortilla chips with your favorite toppings, such as black beans, salsa, sliced jalapeno chiles, and shredded cheese. Bake until cheese is melted and stacks are warm throughout, about six minutes. Who can resist a brownie? Though they taste delicious, they’re horrible for your waistline. 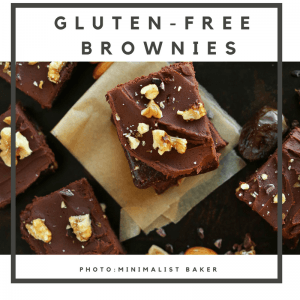 Instead, these gluten free, raw, and vegan brownies from the Minimalist Baker not only taste good, you only need 5 ingredients. And, there’s no baking involved. Bam! You’ve just won the dessert lottery. Place 1 cup walnuts and almonds in food processor and process until finely ground. Add the cacao powder and sea salt and pulse to combine. Transfer to bowl and set aside. Add the dates to the food processor and process until small bits remain. Remove and set aside. 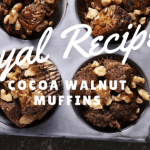 Add nut and cocoa mixture back into food processor and while processing, drop small handfuls of the date pieces down into the food processor or blender spout. Process until a dough consistency is achieved, adding more dates if the mixture does not hold together when squeezed in your hand. You may not use all the dates. Add the brownie mixture to a small parchment lined 8×8 dish and before pressing, add remaining 1/2 cup roughly chopped walnuts and cacao nibs and toss to combine and evenly distribute. Then press down with hands until it is flat and firm. Lift parchment paper to remove brownies from dish and use hands to slightly squeeze in the sides to create a smaller square. Transfer back to dish and place in freezer or fridge to chill for 10-15 minutes before cutting into 12 even squares.